Today’s Notes From the Garden comes from time spent at Our Lady of the Holy Spirit Retreat Center in Norwood, Ohio. Mr. Benjamin, the head volunteer gardener is responsible for developing and caring for the grounds including two large two interior courtyard gardens. As a volunteer, he unselfishly gives of his time and talents. However, as all gardeners of large spaces know, sometimes the garden chores can become a bit much for one person to handle. An employee of the retreat center is there to assist Mr. Benjamin, but he’s often pulled onto other projects within the massive four story structure. At Our Lady of the Holy Spirit Retreat Center everyone learns to and happily wears many hats. A few weeks back I had the pleasure of touring the grounds with Mr. Benjamin. With each plant I could see how much he loves what he does, how much work has gone into creating the gardens and that feeling all gardeners have- I wish I could do more. When it was time to work in the gardens, we spent the first two days addressing the more elaborately planted upper courtyard garden. It’s a peaceful garden: a place for reflection and prayer. But lately things have been a bit hectic. Power washers have been tending to the walls with a water/bleach mixture to clean the bricks. Their work completed in the lower garden, they soon will be working in the upper garden, making it difficult, if not impossible, to access large parts of the garden. To prepare for their arrival, shrubs and trees had to be trimmed to allow workers access to the walls. Some plants were cut back to minimize their exposure to the washing fluids, and some traditional end of season garden maintenance was tackled as well. With the courtyard gardens in order, we then tackled the leaf litter about the large property. Sometimes you simply need a few men with blowers and a leaf vacuum to make quick work of what would be a very daunting project for one person with a hand rake. 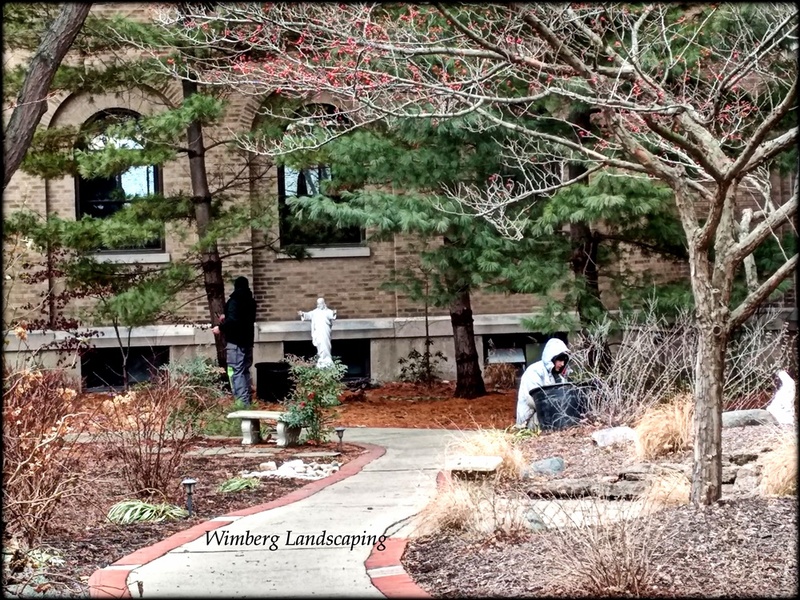 Wimberg Landscaping has been supporting local communities via donations of materials and labor for years, most notably Peter Wimberg’s work with Ault Park’s gardens, arboretum and trail system. These volunteer projects allow the company to give back to the community as well as offer newer employees more time to hone their skills and log more hands-on plant time.